All information added or updated since this page first went up on February 9, 2017 is in GREEN TEXT below. 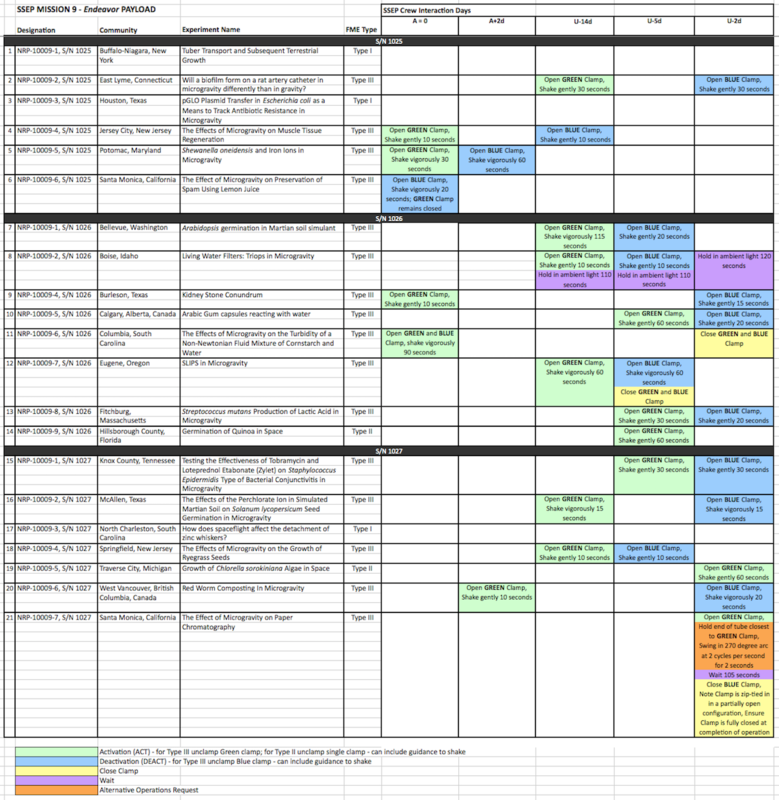 This page provides student flight experiment teams a log of all activities associated with the 22 flight experiments comprising the SSEP Mission 9 Endeavor payload (1 Mission 7 experiment is re-flying with the 21 Mission 9 experiments) from the time the mini-laboratories are received in Houston before the flight of SpaceX CRS-10 to the point when the mini-labs are shipped back to the flight teams after return to Earth. While this page will feature general progress reports on the status of the SSEP M9 Endeavor payload, its main purpose is to provide updates to the student flight experiment teams as quickly as possible regarding the handling of their mini-labs on station, so that they can effectively conduct their ground truth experiments. Teams are advised to bookmark this page and check it for updates throughout the mission. Nomenclature: The purpose of this log is to provide the student flight experiment teams information on the handling of their experiment, as well as providing updates on the progress of the Mission. For this log, the individual experiments are assigned a flight Designation such as “NRP-10009-4, S/N 1025” together with the Community and Experiment names (see Section 4 below). February 18, 2017, 10:00 am ET: launch was aborted 13 seconds before lift-off due to concerns with a thrust vector control issue. The launch was scrubbed for 24 hours with the next attempt scheduled for 9:38 am ET, February 19, 2017. February 19, 2017, 9:38 am ET: SpaceX CRS-10 launched from the historic Space Launch Complex 39 at Cape Canaveral Air Force Station, Florida, the first from the pad since the Shuttle retired in July 2011. Following launch, the first stage of the Falcon 9 rocket returned to Earth without issue. February 22, 2017, 3:25 am ET: Dragon cargo rendezvous with the International Space Station was aborted. Onboard computers triggered the abort after recognizing an incorrect value in data about the location of the space station. Per the re-rendezvous plan built into every mission, the spacecraft automatically reset for another rendezvous and docking attempt in 24 hours. The spacecraft is in excellent shape with no issues, and the crew aboard the space station is safe. The next rendezvous attempt is targeted for Thursday morning. 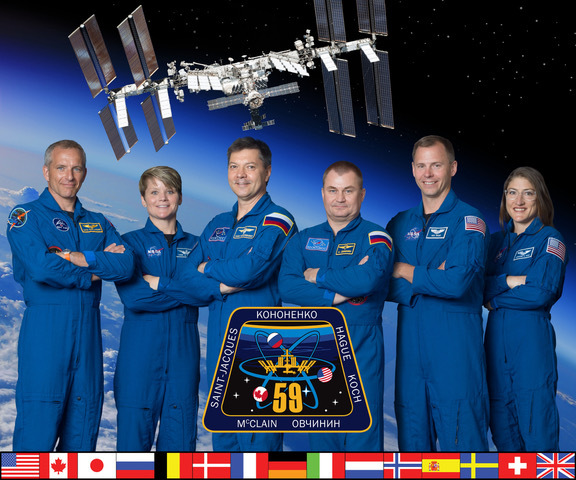 NASA TV coverage will begin at 4 a.m. with grapple expected around 6 a.m. Installation coverage will begin at 8 a.m.Watch live on NASA TV and online at: http://www.nasa.gov/live. February 23, 2017, 5:44 am ET: Dragon vehicle was captured using the Space Station Remote Manipulator System (SSRMS) at 5:44 am ET. Robotics Ground Controllers then used the SSRMS to maneuver the Dragon to and install it on the Node-2 Nadir Active Common Berthing Mechanism (CBM). NRP-10009-2, S/N 1025: East Lyme, Connecticut, Will a biofilm form on a rat artery catheter in microgravity differently than in gravity? NRP-10009-3, S/N 1027: North Charleston, South Carolina, How does spaceflight affect the detachment of zinc whiskers? March 19, 2017, 10:48 am ET: SpaceX representatives reported a successful splashdown of Dragon off the coast of Baja California. The space capsule left the station early Sunday after being released by astronauts Thomas Pesquet (of France) and Shane Kimbrough (of NASA) using a robotic arm. March 23, 2017: NanoRacks initiated return shipping of flight mini-labs to communities. March 28, 2017: After correction of issues with FedEx return air bills, today the final flight mini-labs are confirmed shipped to communities.